The tasty & healthy spice, ginger, is usually available to us in the US year round… However, at our local co-op here in Buffalo, NY, their only consistent source of US grown ginger comes from Hawaii! Ginger needs about a 10 month long frost-free period to be able to produce the large roots with the brown papery covering that allows them to store for long periods of time. 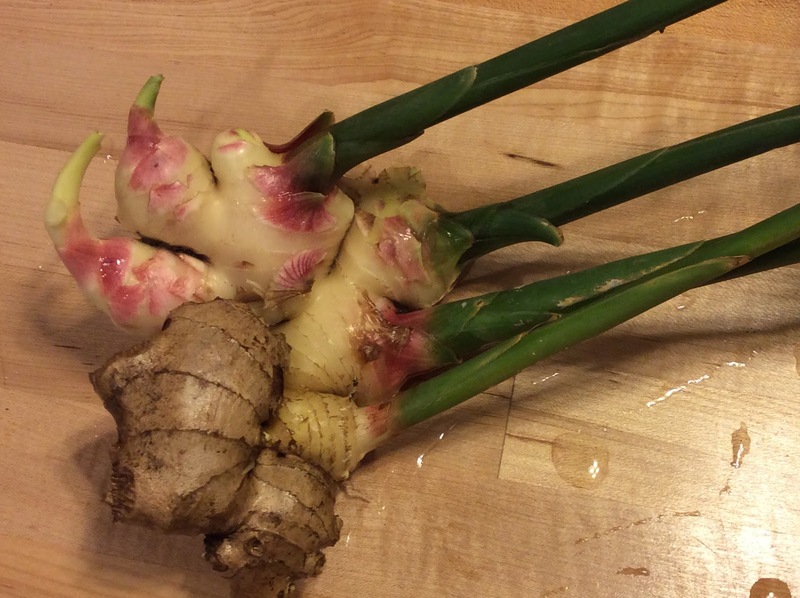 In Buffalo, even starting the sprouts indoors in March, and moving them into hot houses all summer long, we are still a few months short of growing fully mature ginger root. 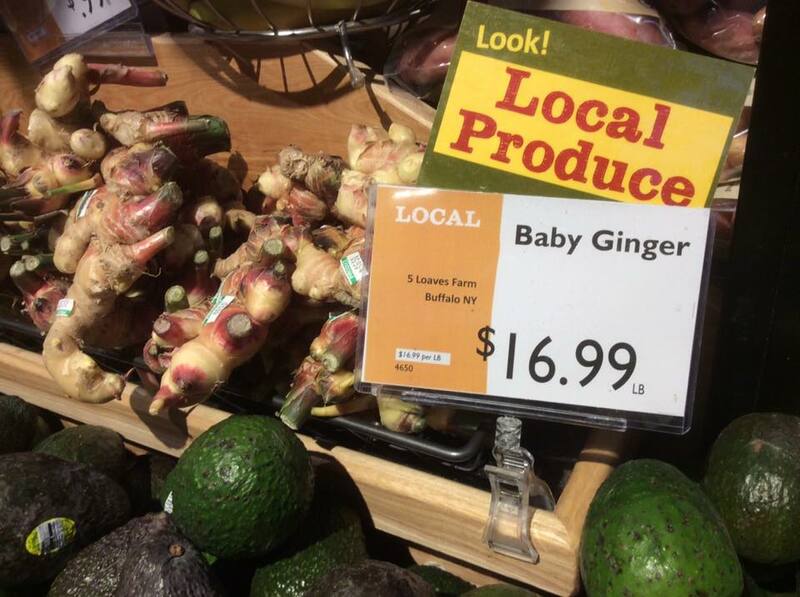 So, the ginger we bring to market is “baby ginger”. Instead of having a brown papery coating, it is white or pink, & there is no need to peel it when cooking with it. The flavor can be somewhat stronger as well, if used fresh. It does, however, need to be used up within a couple weeks, or frozen to preserve it. It can be used just as regular ginger root in recipes, but is most often used to make pickled ginger, like the kind you find accompanying your sushi rolls. This year we were able to grow ginger again & as the nights cool it is now time to harvest! Our experiment with growing ginger is just one example of how urban farms can be hot beds of innovation; pioneering new sustainable growing techniques, developing novel crops, & testing new markets. They represent a new type of urban green space. Providing more than just a passive benefit to the surrounding community, they actively benefit them by producing healthy foods, providing jobs, serving as cultural centers that educate & unite communities around food. They improve soil & air quality, divert waste from landfills, & pilot the green roofs, grey water retention systems, & alternative energy sources that are the future of sustainable infrastructure in our cities. Urban living is the sustainable living model of the future, & urban farms only enhance the sustainable nature of urban communities. Buffalo has been called the “best designed city in America” because of the forethought & planning that went into Olmsted’s creation of a system of green spaces that accentuated the city’s radial street grid. Now with less than half the population it once had & over 20,000 vacant lots within the city limits, the city is ideally set up to create a new sustainable grid of green spaces – urban farms – throughout the city. 5 Loaves Farm is proud to be a part of this movement & seeks to see this vision embraced by the planners & powers that be in Buffalo. We plan on continuing to innovate, continuing to promote sustainability, & actively making Buffalo a better place to live.